Nigerian Military yesterday said on most of the girls abducted by people suspected to be members of Boko Haram terrorists from Government Girls Secondary School in Chibok, a community in Borno State Monday evening have been released. “With this development, the Principal of the school has confirmed that only eight of the students are still missing,” armed forces spokesman Major General Chris Olukolade said in a statement sent to media. Earlier reports indicated that some of the girls had on their own earlier escaped from the kidnappers. 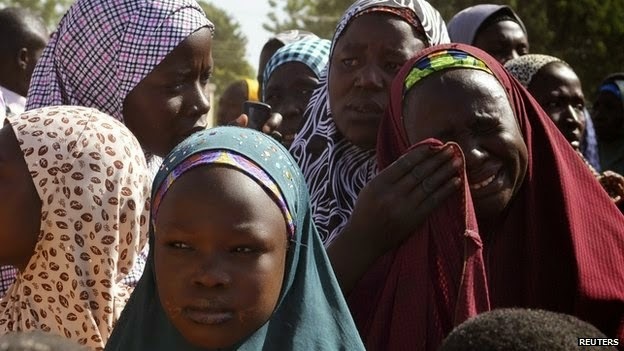 “More of the abducted students of Government Girls’ Secondary School, Chibok in Borno State have this afternoon been freed as troops pursuing the terrorists close in on the den of those believed to have carried out the attack. “A total of 129 students had earlier been abducted by a group of terrorists,” said Olukolade. General Olukolde also revealed in the statement that troops deployed to restore law and order in Wukari, Taraba State, have apprehended 14 armed men who were involved in the fighting during the civil disturbances in the town early in the week. The fighting resulted in the burning of no fewer than 25 houses and displacement of over 200 persons. “Security forces have been directed to continue with the tempo of offensive on all the terrorists’ enclaves anywhere in the country,” said Olukolade. Thank God for the life of that girl oooooooh!